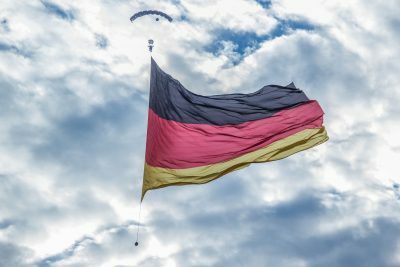 A record turnout is expected this year at the 41st CISM World Military Parachuting Championship, but that’s not the only parachuting landmark expected to take place in central Germany in July 2017. Nearby, in Soest–Airtec’s home base–the CYPRES Demo Team is aiming to set a new Guinness World Record for jumping the biggest flag ever. To fold the flag for a safe deployment, we need the assistance of at least 12 people. Folding the flag takes us almost four hours to complete. To find out more about what it’s like to jump attached to a truly enormous piece of fabric, we asked Ralf “Grabo” Grabowsky: a 34-year veteran of the sport who made his first skydives back in the 1980s during his training to become a German Navy Seal. 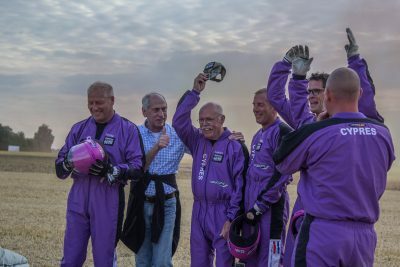 He’s been a competition skydiver ever since 1984, when he took up competition in accuracy, Grabo started competing in 4-way RW in 1989, then added demonstration jumping to his quiver, using demo jumping to inspire young people to join the Navy. Since 2006, Grabo has been guiding the German Navy Seals in all Air Operations. Grabo joined the CYPRES Demo Team as a founding member in 2012; these days, he logs plenty of miles traveling from his home base near the Baltic Sea to jump at dropzones around the region. With nearly 8,000 jumps in his logbook, there are few skydivers as encyclopedically prepared for the challenge as Grabo is. We caught up with Grabo as he was traveling to make final preparations just a week before the big jump, and asked him our burning questions about this landmark event in the sport. Q: Where did the idea come from to jump the largest flag ever displayed on a skydive? The huge container needed for the WR flag jump! Grabo: The idea to set this particular World Record was born a year ago. That was when our team was asked to be a part of the CISM Championship as a Staff Team. Hotte [Horst “Hotte” Salmen], our Team Captain, was participating in the CISM planning meetings and offered the possibility of presenting the opening ceremony with flag jumps–not the simple kind, but something truly special. Hotte knew about my dream to fly the largest flag ever, and he saw the opportunity. Now, with ten months of hard teamwork at our backs, we’re making it come true. This will be a team record, for sure. Q: Ten months! Tell me: What preparation is necessary for such a jump? Grabo: We had to develop a container for ourselves to hold the large amount of fabric for a jump off an airplane. I’ve been a Master Rigger for 20 years, so I accepted the challenge myself to build a unique container. This container is not only opened to drop the flag, but it is completely detached from me and falls almost 120 foot below me when deployed. The container has been installed with nearly 100 pounds of lead in order to serve as the counterbalance to me. The “flagpole” is made of webbing which is thus held in tension. Then, of course, there’s the flag itself. 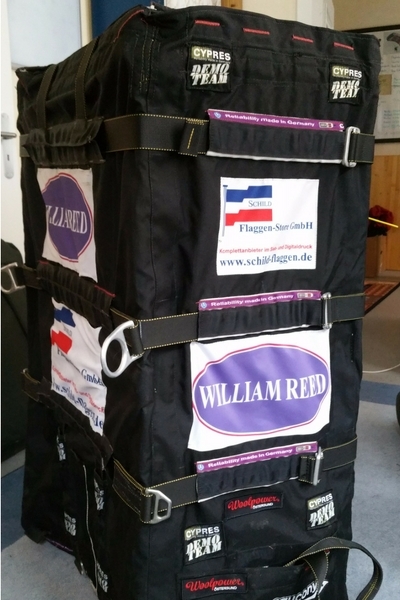 An English company called William Reed Fabrics gave us a brilliant tear-proof, super-light fabric to work with, and more than two kilometers of fabric had to be sewn with the support of a German company called Schild Flaggen Store to an area of more than 20,000 square feet. This special fabric is eight grams per square meter lighter than normal parachute fabric. Another challenge is to fold the flag as small as possible in order to fit it into the container. To fold the flag for a safe deployment, we need the assistance of at least 12 people. Folding the flag takes us almost four hours to complete. Q: How does the flag influence the dynamics of flight and steering? Grabo: There is no freefall time. Not even an static line. The jumper gets a PCA right from the door. From that point, the influence of the flag on the flight is difficult to calculate. It is primarily dependent on the wind conditions. The parachute to be used in the record attempt is a prototype with an area of 480 square feet, allowing for the weight of the flag fabric and the counterweight below the jumper. In my experience, the sink rate drastically increases–doubling, in fact. You can’t just throw a turn in, so I have to be very gentle and disciplined about the altitude at which I enter any turn. During the flight, I will be supported via radio by another member of the Demo Team who will update me on conditions so that I can react in time. There is also a trim toggle on every single riser–front and rear. The fabric is meant to unfold completely as soon as the flag is released. I do not expect negative influences, unless it unfolds improperly. In this case, I would separate it with an specially developed emergency cutaway handle. Q: How do you decide if the conditions are right for a jump? Grabo: First of all, I need to get an exit altitude of at least 6,500 feet. Secondly, the maximum wind speed is 14 knots. If the wind speed is not within that envelope, I wouldn’t take off. Ideally, the conditions would be a windspeed of six to eight knots, clear of clouds at 8,000 feet AGL. Q: What is the feeling when you’re jumping such a huge amount of fabric? Grabo: That is one of the most-asked questions about this jump: How the hell does it feel to jump a flag that big?! It’s tough to describe it; I run out of words. But let me answer by asking you: What is the feeling when your biggest dreams–a once-in-a-lifetime dream–comes true? It is an emotional explosion. You stop breathing; you feel no pain; your body is on high alert to react in time to whatever happens during the jump. I ain’t scared or upset. On the other hand, I am full of respect for this jump, and I’m nervous as can be to be observed by forty-three nations during a major World Championship opening ceremony! I’m also very confident that, with the support of the CYPRES Demo Team and with all the preparations we’ve undertaken, I will be safe. There is no doubt that we will set a new record for jumping the biggest flag ever. CDT will take the challenge, one hundred percent!